Before the two races on Sunday 18th November, Matara was leading the M-Class series by one point ahead of Menace. It was Matara’s to lose, and lose they did, in spectacular fashion. On the ramp, there were five boats ready to race. Menace, Matara, Mach One, Marksman, and a new player to the game, M52 Monsoon. The weather had finally warmed up enough for fair weather sailor Hamish Milne to dust off his sailing hat and join the fleet after a two season absence. The oscillating breeze saw a change in course for the fleet, who were expected to race on the eastern side of Bean Rock. 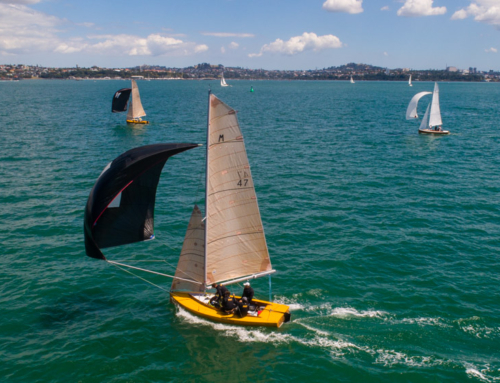 However the course was moved in the Orakei area with two windward/leeward courses set using the fixed marks of Resolution and Orakei. Matara was eager to get on the line early, and helm Suellen Davies forgot for a moment that she was in a five boat M-Class fleet and not a 100 boat Laser fleet. While not being over, she and her crew were definitely early, resulting in a start at the least favoured end of the line. Menace, Mach One, Marksman and Monsoon sailed over the top of Matara, putting the current series leader in a bit of a predicament. “‘Control the peak’ were the words echoing in my mind, constantly said to me by pro-sailor Chris Steele in a previous Sunday session of racing,” said Suellen. Unfortunately for Matara, the course didn’t have a lot of passing opportunities, and they had to fight hard to gain places. Meanwhile, Marksman and Menace trucked ahead but it was Menace who got the gun in a spectacular fashion and exceptional display of crew work. Marksman who had a good tussle with Menace finished in second with Matara managing to creep into third. Mach One was fourth and Monsoon fifth. After an adult beverage to settle nerves, the crews were ready to take on the second and final race of the day. 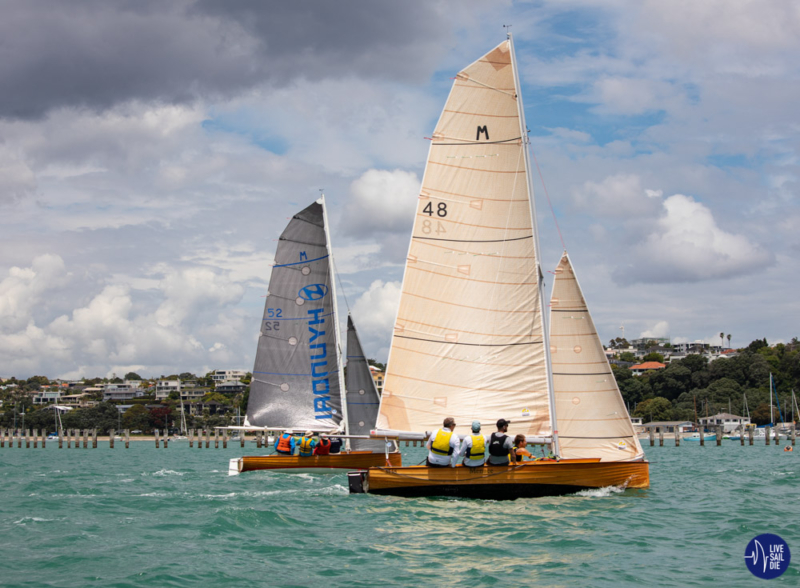 The breeze had increased to around 12 knots peaking at about 15 in the occasional gust, enough to get the classic kauri clickers off their butts and cruising around the course. The same windward/leeward race was set and it was all on. Menace, after claiming the race win just moments prior, was now in control of the series by one point. Menace took control of the fleet right off the blocks this time with Mach One bringing it up the inside sitting comfortably in second place with Marksman, Monsoon and Matara fighting for the final podium place. Up the first beat Marksman made a shocking exit from the race after loosing their main halyard. With Marksman limping back to the ramp for an early pack up, and relegated to sausage cooker at the BBQ station for being the first boat back, it was all down to Matara and Monsoon for who would finish in third, because it was clear that Menace was unstoppable, and Mach One had found her groove. It would have taken a serious error on board both Menace and Mach One for Matara and Monsoon to pull them back and at the final crossing of the finish line, it was Menace then Mach One followed by Matara then Monsoon. Monsoon, despite their absence for previous races, showed outstanding form and minimal rust. The Owen Reid designed and built Emmy showed that she will be a force on the race track for the remainder of the season, giving the fleet another player to watch. With the turn around in results, this now puts Menace ahead by three points, and the team of Matara to reevaluate their boat set up, and take the hiding as a lesson. “It was a good day for the Menace, with a return to form. Both starts where good, judging the tidal flow well with the requested boat end won, close enough to high five the PRO and then followed by good upwind beats. It certainly helped in Race 2 with Marksman dropping her main. We had good boat speed and four good hoists, getting progressively better throughout the afternoon. The last hoist saw the kite up & set before the gybe was completed and a very happy skipper! But what was even better, was that the beers where cold all day,” said Menace skipper Howard Spencer. “You have to take the bad days with the good and while we may have been hurt results wise, we still had an epic day of racing – there isn’t much to complain about when you’re sailing with cold beers!” said Matara skipper Suellen Davies. Mach One, who sailed with three brand new Emmy sailors was rather thrilled with their results. 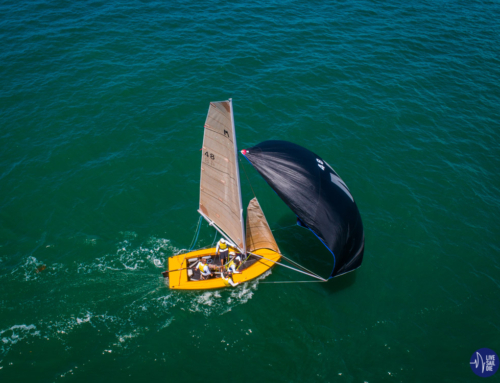 “The guys are new to the class and all things considered, we had a great day of racing. It was nice to lock away a second place as well! The best part is that the guys have all signed back on to come and race again, and our beers were also cold.” said Mach One skipper Nick Hanson. Racing continues on Sunday 25th November with another two races on the schedule. Marksman should have a DNF for race one as they only raced 3 up. Rules stipulate min of 4, max of 5.